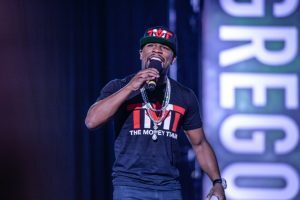 Floyd Mayweather has announced his desire to return to Japan this summer to pick up what he surely feels will be another easy payday after thrashing kickboxing star Tenshin Nasukawa last December, for a check said to be between nine and ten million dollars. But, according to TMZ, that’s not all. “Floyd Mayweather,” the site claims “says the exhibition fight business will be VERY good to him in 2019 — with 4 or 5 bouts lined up this year, which will pay him around $80 MILLION!! !” Mayweather’s last official fight was a wildly hyped novelty match with UFC star Conor McGregor back in 2017. Boasting a record of 50-0, the Las Vegas based fighter now appears comfortable to earn himself what most would consider to be easy paydays. “This time,” TMZ states, “Floyd says he’s fighting a former Japanese boxer (he’s not 100% sure who the guy is) — but tells us he’ll cash a $10 million check to go 3 rounds with his mystery opponent.” Mayweather is known to talk off the cuff, but if his stated exhibition agenda is true, the chances of him rematching arch rival Manny Pacquaio any time in the near future (neither man is getting younger, by the way) are slim. The original match between Mayweather and Pacquiao, was the most lucrative fight in history. A rematch would arguably do healthy business, as well. Still, Mayweather, who seemed to have warmed to the idea of a second go with Pacquiao for a bit, seems to have his mind on less challenging fare. Again, though, Mayweather is known to talk off the cuff. No one really knows what the man is going to do next. The iconic fighter genuinely seems to love his money. And the prospect of easy paydays in Japan, if they truly do present themselves, surely must be enticing. Mayweather demolished Nasukawa late last year. If he can make the same kind of money to do the same thing again to another fighter, it might be a safe bet to assume he’ll cash in. This being Mayweather, however, no one can be sure what route the man may ultimately opt to take.